When you notice rust, damage or noise coming from your muffler it is time to bring in your car. With Ali's, you will get quality auto service starting with a comprehensive inspection and diagnosis of the problem your car is having. For every muffler problem or whatever the problem is with your car, we are here to help. Ali's is proud to service all types of makes, models and years of vehicles. We work on small cars, large trucks and everything in between. 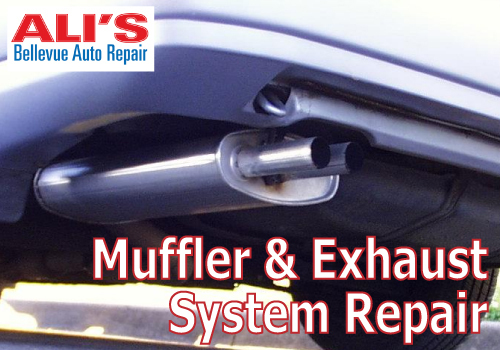 We work with any type of car or exhaust issue including muffler repair and replacement. We've been handling mufflers and all other car needs for Redmond residents for many years and we will work hard to provide outstanding customer service and exceed your expectations. When you notice smoke billowing out of your car you may have a muffler issue. Other symptoms of muffler problems are damage to your muffler or rattling. Your car's exhaust system uses the muffler to minimize sounds from the engine. The muffler is a series of tubes with holes that help reflect sound waves. 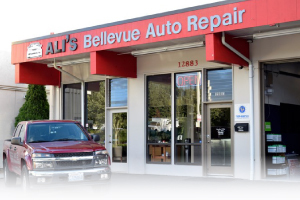 At Ali's Bellevue Auto Repair we are ready to serve your car or truck. We provide a wide array of auto repair and services. We work directly with you to provide cost-effective, quality solutions. We will get your car quickly fixed and you can get back on the road. With thousands of satisfied customers, we are highly recommended in Redmond. Give us a try today and call us at 425-450-9713.